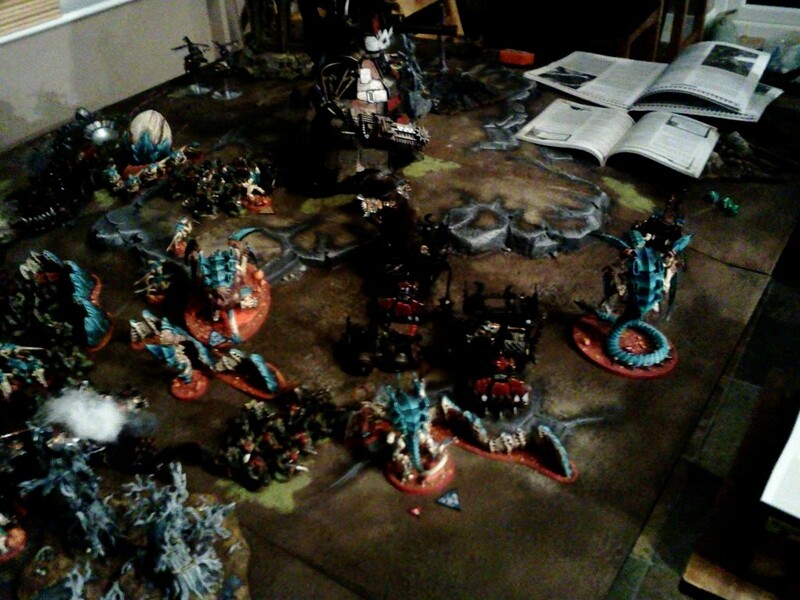 Confessions of a 40k addict: Battle Report 1500pts - Nids v Orks! ﻿My old gaming buddy Ben had me round for another battle before ToS, this is quite a while back and some of the questions raised have since been answered but please be patient with it, it takes to long to retcon all the historical inaccuracies now. 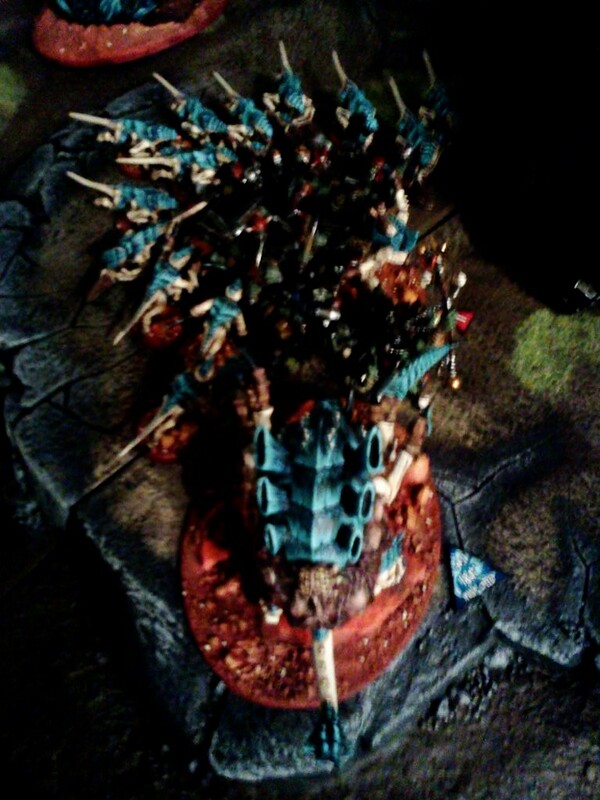 His Necrons have been utterly brutal on me recently so he decided to go easy and use his Orks. Now these aren't the Orks he came 6th with in Throne of Skulls last year but there was plenty to scare me as I've never played a full Ork force properly. 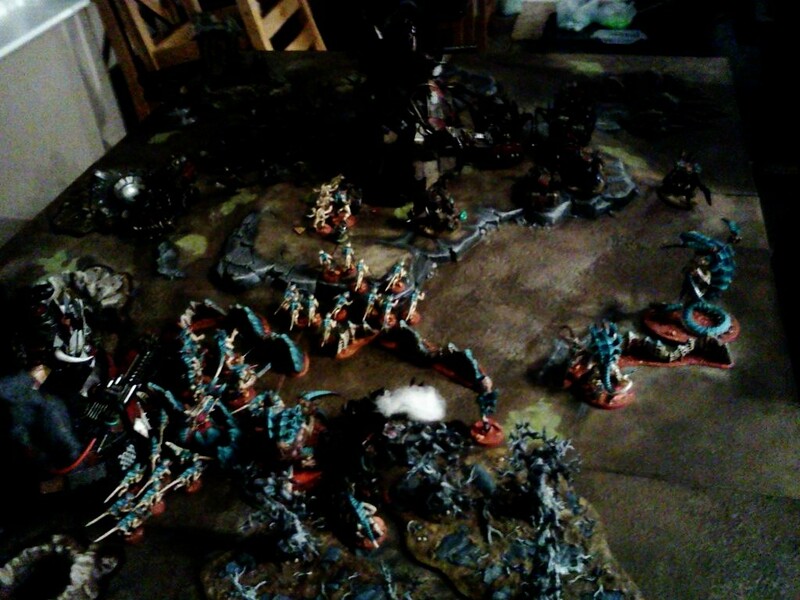 There were 3 Killa Kans, 3 Trukks and Wartrakk, warbuggy and 3 Deffkoptas. 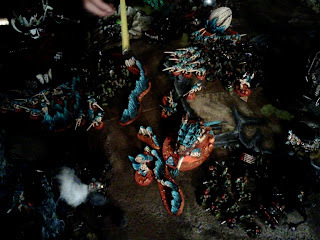 He also had a big 30 man blob with Weirdboy at least one or two units of Nobz and another 10man+ unit so all three Trukks had guys in tow. I'd brought along a force similar to what I want to take to ToS, but with the Hive Tyrant instead of a second Tervigon and it was the first outing for my Defence Line and Quad Gun [obviously this shows how long ago the game was pre-FAQ nerfing!]. The pics are at a distance because the closer I got to the board the more shadow was cast so hopefully there's enough to go with to see the action. 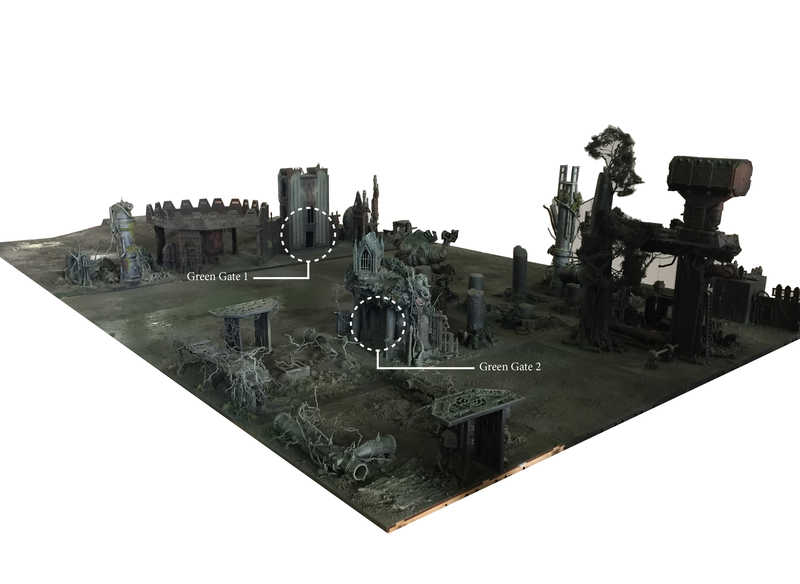 I'd had a vision earlier in the day we would be playing the Relic and when I saw the board set up with two of Ben's Stompas as impassable terrain and very little room for my defence line I guessed fate would dictate a hammer and anvil setup and I was correct on both counts. I know fortifications go down before the terrain but we didn't worry too much about that and so I crept the line a little forwards so I could sally forth, steal the relic and then retreat to my cover whilst gunning down everything that got within reach. My Warlord trait was +1" to charge distance and I got quite a decent set of psychic powers to replace the Tyrants, Tervigon and Broodlord. Ben got first turn, I couldn't steal the initiative. 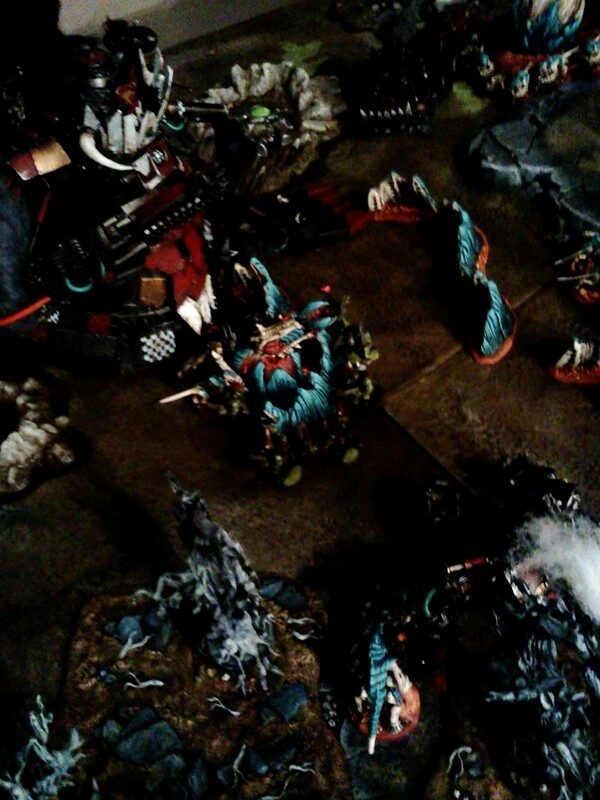 He moved stuff up [obviously] his Killa Kans grotbuster [?] 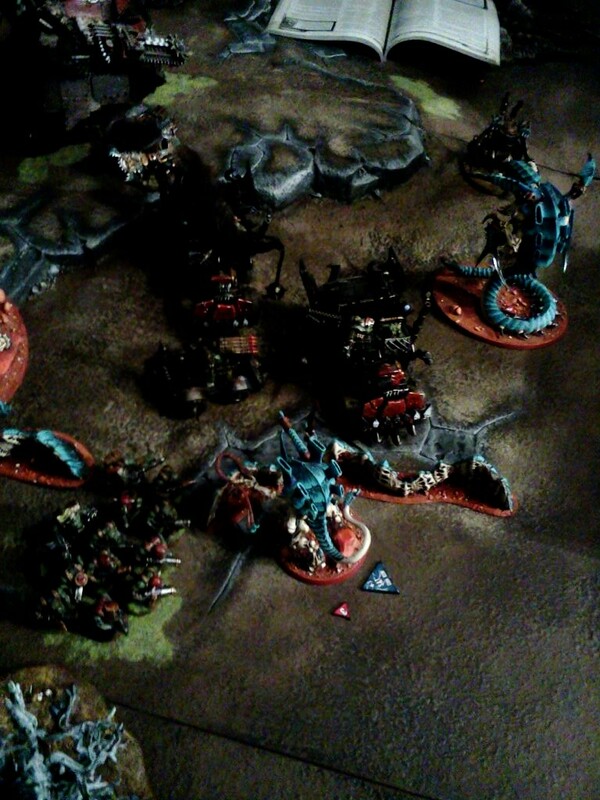 gun taking out at least 3 of my 8 stealers putting them down to my usual starting numbers! 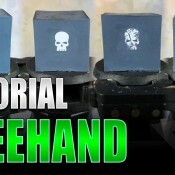 He also targeted the quad gun, in a bid to kill it before I even got chance to fire. 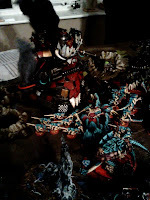 It took a wound and so too did the Zoanthrope in the mysterious forest but he survived a massive amount of firepower aimed at him in an attempt to gain first blood. He must have made at least nine saving throws! My turn 1, everything advance [obviously]. For some reason I chose not to use a psychic power on the Hive tyrant, missing out on Iron Arm and Enfeeble. He fired his Venom Cannon at the Grotbuster Killa Kan but his the one next to it just taking a hull point. 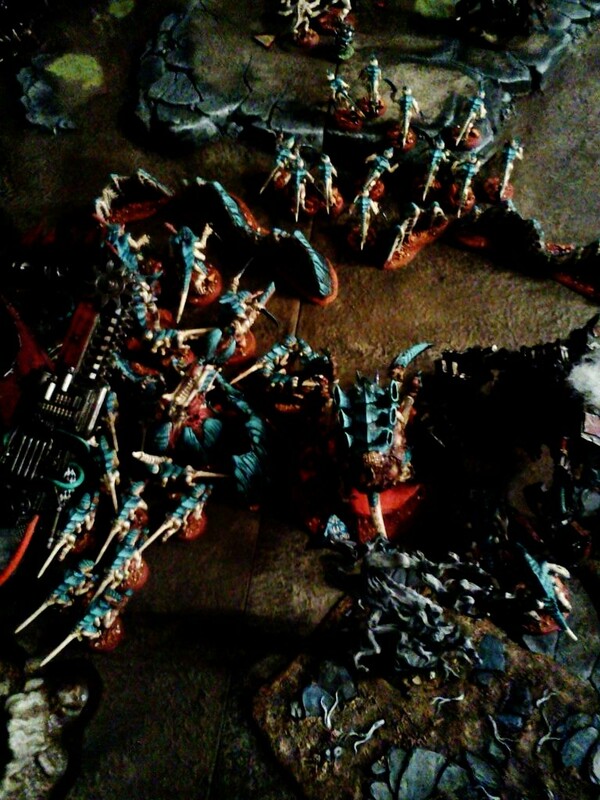 The Trygon ran over the Aegis. 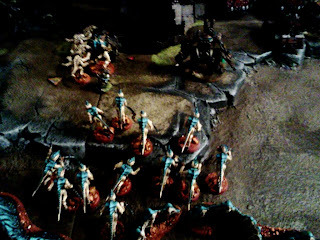 the Hive Guard, hiding behind a ruined giant Deff Dread fired, I think they got a HP on one of the trukks, or penned and got a weapon destroyed - certainly not the successful shooting I was hoping for. The Warriors stepped over the first Aegis to allow room for the Tervigon to spawn Termagants next to the quad gun. 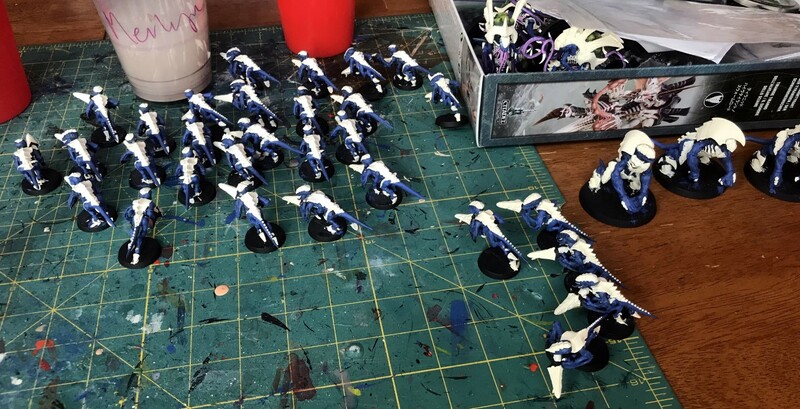 I was hoping to keep the numbers down so it wasn't too cramped, but I got 14! but no doubles at least. He cast Warp Speed on himself [for no reason] and got +2 I and A. The Warriors and quad gun targeted the Deffkoptas - killing one and wounding another - they failed morale and puttered off back the way they came. 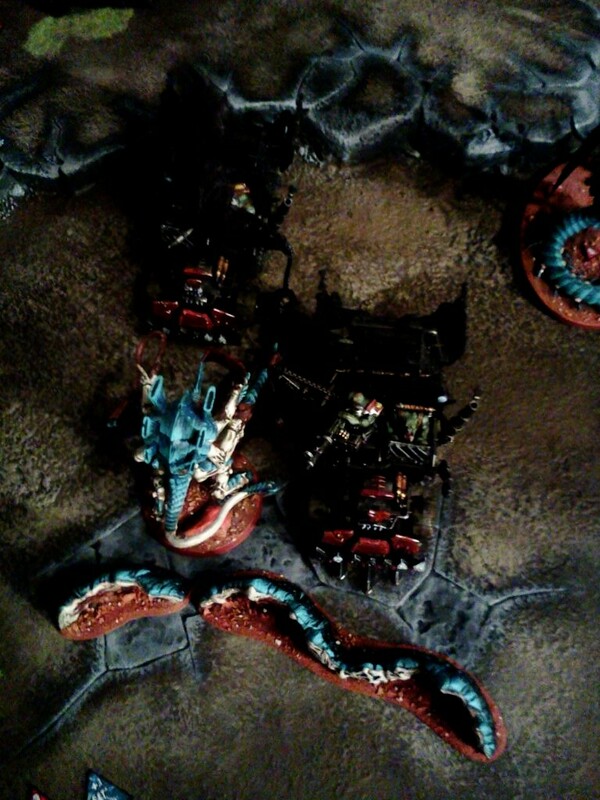 The Tervigon let rip with it's Stinger Salvo, taking a HP off the War Trakk. 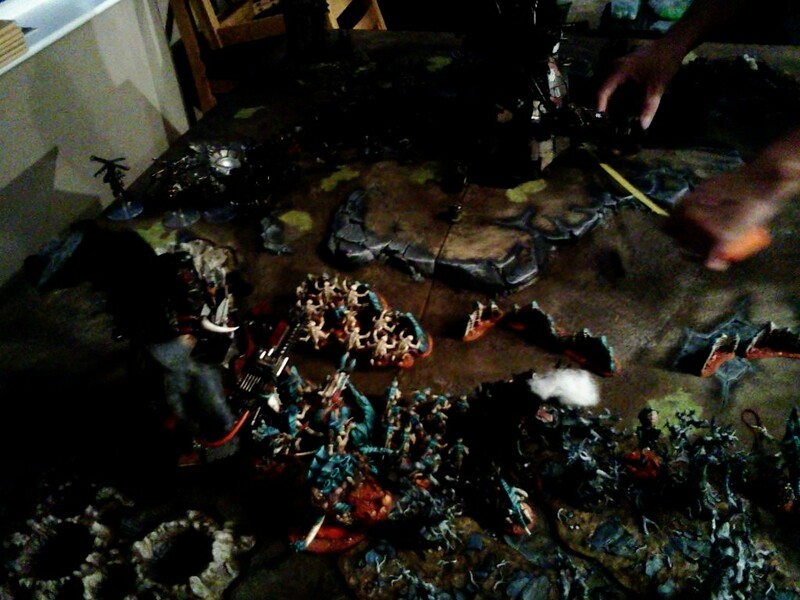 The Broodlord cast Endurance on the Stealers as they headed towards the Wartrakk bearing down on the relic. He mullered it to pieces gaining me First Blood. 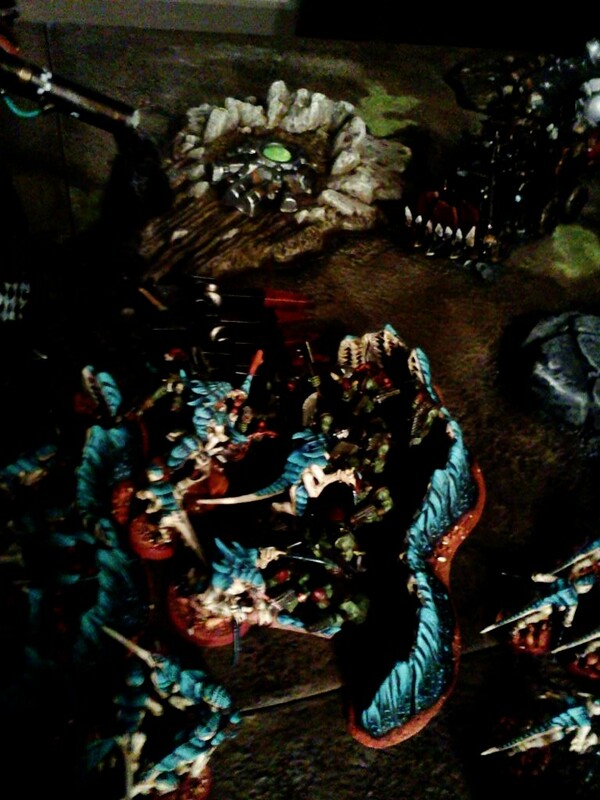 The Hormagaunts followed closely in support and to try and capture the relic but were too short. 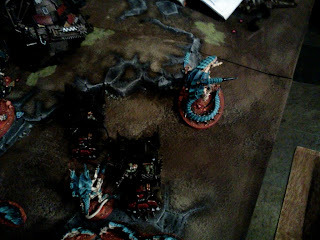 Although the Deffkoptas were fleeing, first blood and the od HP my overall view of the turn was not good and a lot of my dice rolls had been below average. 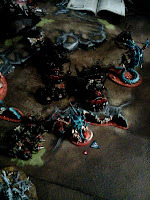 However, Ben was feeling a little under pressure with few options to take out my monstours creatures he burned his Trukks forward, jumped the boyz out to take on the Tyrant and sent his Warboss at the Tervigon who picked a wound off him through overwatch. I'm not sure how successful these assaults were. 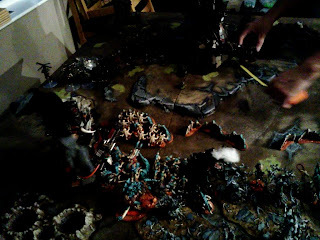 I think we ended up locked in combat for that turn, the Warboss did more damage than you would expect and the Trygon held in there, the fololowing turn the Monstrous creatures won out, killing the boss and enough orks for them to be swept away after failing their morale. But my turn of assault before this was particularly poor. 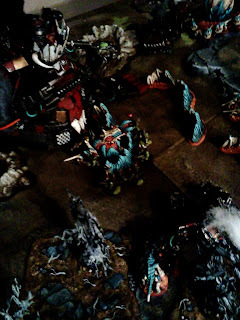 Meanwhile only the Broodlord remained he 'died' at one point wa sremoved from the board, orks consolidated and everything but then we remembered he still gets his Feel No Pain roll, and managed to save enough to retain one wound left. The termagant spawned another 10 gants who bundled the Ork mob with the Devgaunts who had previously glanced the back of the Trukk to death. 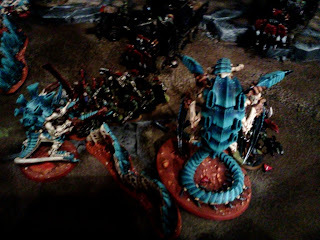 the Tervigon wound up his Warp Speed for another +3 I and A so on the charger he would be 4 attacks +3 [D3 rolled] crushing claws and +3 Warp Speed. Really need to understand what happens to Smash in this situation as most rules I've read state the Crushing Claws are added after the Smash halves the A characteristic, but what happen to Warp Speed? The last mob of boyz came out, on this side they threw everything at the Zoanthrope, Tyrant and Trygon. The Zoiehung in there and I think he'd managed at least one mech kill I think. The orks moved for a better position and the Deffkoptas rallied at the last minute to return to the battle, just too late. The Orks continued to kill the Termagants on the Aegis. Everything piled on the poor Orks in the middle surrounding the Relic, you remember the Relic the thing we're supposed ot be fighting over but no one has actually picked up yet. By this stage Ben had started to get some seriously bad dice rolls. A lot of St 10 weaponry ending up with 1s and despite a change in fortune, once again coincidentally at the moment his wife came home from work that good fortune evaporated as my Psychic Powers began to tip the balance. 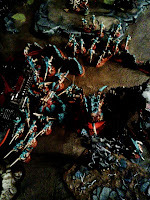 The Hive Tyrant had been on +3 St and T for two turns with Iron Arm so by this stage he was nigh indestructable, regardles of how many wounds he'd already received. 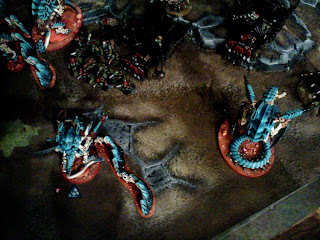 Meanwhile the Trygon killed the last of the Killa Kans but was short of his deployment zone but it was getting on after midnight and with the blob of Orks gone in the middle and both first blood and Slay the Warlord under my belt he wasn't going to recover so he called it and I finally broke my duck. Sometimes the last thing I want to do is start taking pictures as it'll be a two day battle that way! 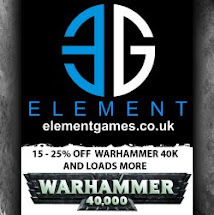 As to the lighting, well if you use Imotekh then the lighting will be spot on! I was actually quite happy with it as at the time I hadn't finished my Defence Line so didn't want the pics to be too clear to give away the finale from the step-by-step posts. Of course that's moot now but never mind. The table looked fantastic despite the lighting. Thanks for typing that up... I always enjoy battle reports.